This mod adds the Fallout 4 looting menu to Skyrim. SkyUI Team for resources to make swf file. 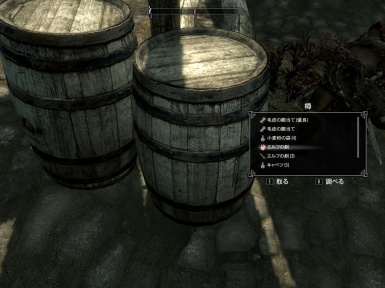 This mod adds looting menu like Fallout 4 into Skyrim. Open simple looting menu when you set center of the crosshair on a container or dead body. No need to open item inventory each time! Extract the downloaded file, and simply copy its contents to your Skyrim data folder. There is no need to clean save and stop quest. You can uninstall it whenever you want. Uninstalling this mod is breeze just remove three files, LootMenu.swf, QuickLoot.ini and QuickLoot.dll. D-Pad up and down: select item. Hold down the sheath/unsheath button for 2 second, and toggles QuickLoot on and off. Data\SKSE\QuickLoot.ini can be set configuration. If you have garbled character in loot menu, or you want to change UI or set conditions of using quick loot menu. Please make sure this file. - Fixed the issue where the player can loot unusable torches. - Fixed the bug with CTDs which caused by remnants of removed mods. - Added a feature to toggle QuickLoot on and off. - Handled Namira's cannibalism and corpse feeding with BetterVampires. - Added ini option "bDisableLootSingle"
- Added ini option "iItemLimit" to avoid CTD on container with many items. - Fixed the problem with chest gold. - Made sorting faster and eliminated useless process. - Added sort feature for loot menu. - Fixed the issue with displaying loot menu while in killmove. - Improved compatibility with HDT Physics Extensions and HDT HighHeels System. - Fixed the bug with accessing to already freed string. - Added enchantment and already read icon. - Added an INI file: Data\SKSEQuickLoot.ini. Please make sure this file. - Added console commands for in-game configuration. - Maybe fixed the issue with garbled character in the menu. - Fixed the bug where the player can pick up unusable (hidden) items. - Fixed the bug with not disappearing loot window when the player dies. - Fixed the issue with the d-pad not working due to already assigned hotkeys. - Improved compatibility with Hunterborn. Hackfield for dialogue style interface.